LEAD: NASA scientists have identified the process that changed Mars from a warm and wet Earth-like planet to a cold, arid world. 1. 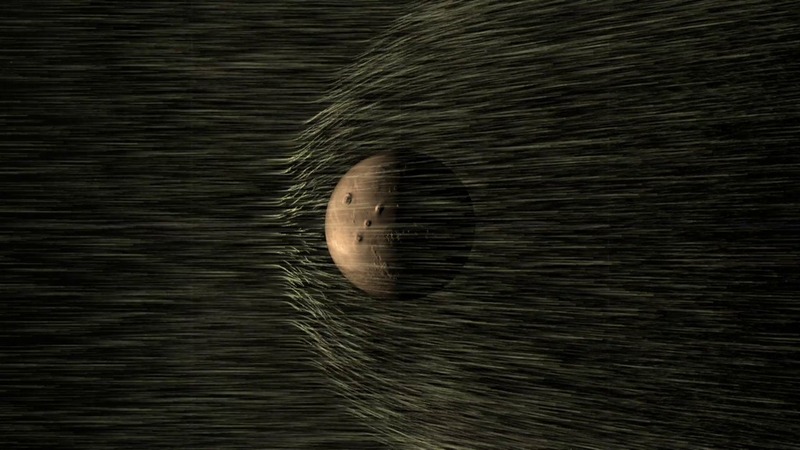 New results from NASA’s MAVEN mission show the Martian atmosphere has been stripped away by a stream of particles, known as the solar wind, flowing from the sun at a speed of about one million miles per hour. 2. The Martian atmosphere has escaped from different regions of the Red Planet, including down the "tail," where the solar wind flows behind Mars, and above the Martian poles in a "polar plume." TAG: Fortunately, Earth's atmosphere is protected from the solar wind effects because it has a magnetic field, which acts as a shield and deflects the stream of particles blowing off the sun.